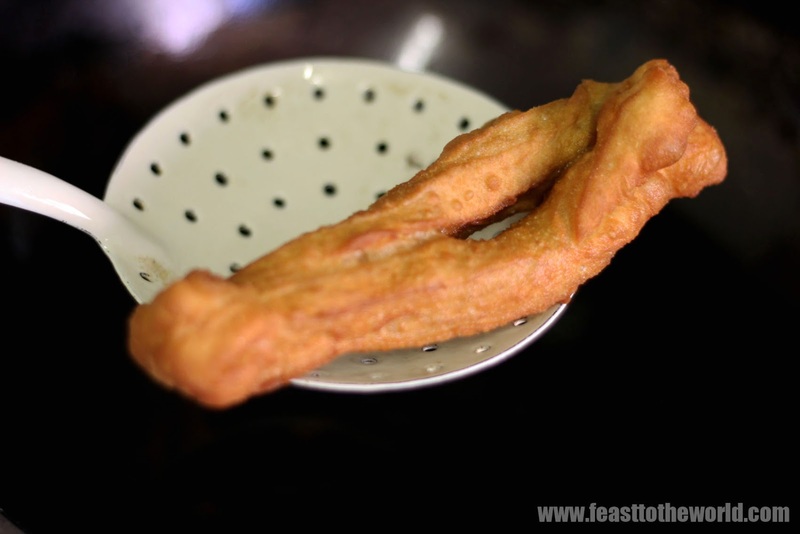 No doubt you would have come across these popular Chinese doughnuts/doughsticks, known as You Char Kwai 油炸粿 or You Tiao 油條, a familiar sight in many Chinese bakeries in Chinatown. They are typically eaten during breakfast, freshly fried doughstick are often torn and dunk straight into hot Kopi (black coffee) or soy milk. 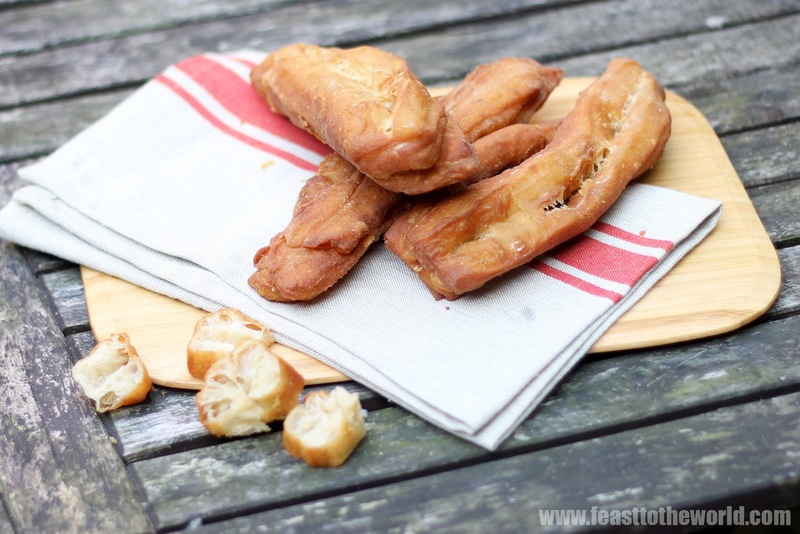 My nan would often stuffed them with minced pork and deep-fried for a delicious nibble and sometimes she filled them with tuna mayo or Kaya for a quick and easy sandwich, sound bizarre but utterly scrumptious. To this day, I still spread Kaya onto mine thanks to my nan. They are also frequently served with Tau Suan 豆爽 , one of our nation favourite dessert made of mung beans. It is also a familiar ingredient often found in the making of Rojak. My absolute favourite is when served with Bak kut teh, perfect for dipping into the rich herbal broth to soak up all those umami flavours. And a bowl of juk or congee (Cantonese rice porridge) will not be the same without slices of this crunchy toppings. Making these crispy batons take some serious planning and practice as it is a lot harder than it appears. 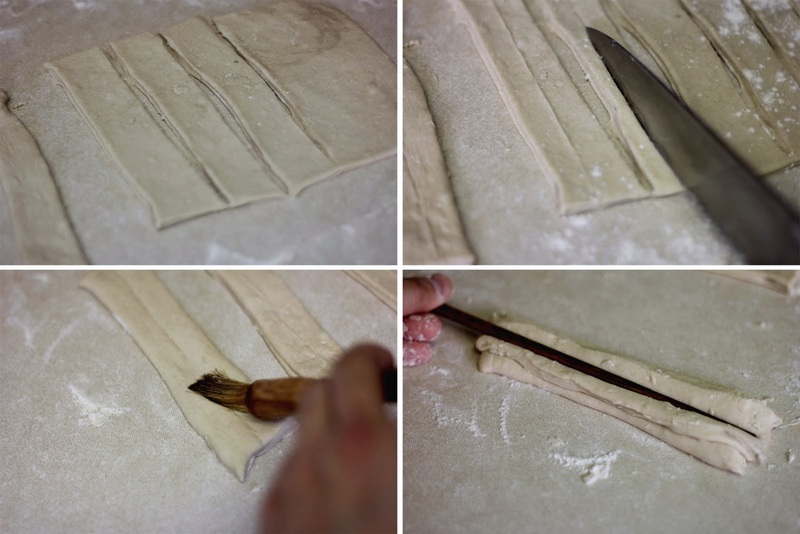 It uses 'wet' dough which means that it is trickier to handle and has a tendency to stick so getting that signature 'twins' look require skills. And like making a loaf of fine bread, it is not something that can be knocked up in a hurry. The dough need a minimum resting time of at least 9-10 hours. Anything less than this and your dough stick will be heavy and stodgy, not what we are after here. The best way is to prep the dough a day beforehand and allow them to rest in the refrigerator overnight. Some recipes I've encountered in the past includes yeast. Although this does encourage the dough to rise, it produces evenly distributed air pockets which is not a characteristic I would associate a you char kwai to have. The uneven holes are what give them the light and hollow texture. Personally I find the presence of yeast just doesn't give it the right flavours. Crullers made with yeast also tends to lose it crispiness once cooled so I omitted this completely in my recipe. I would, however, highly recommend that you seek out the ammonium bicarbonate for this. This whiffy powder is what give the cruller it's distinctive taste. You can find this in many good oriental supermarket or online. Do not panic when you open the package as that familiar 'odour' will dissipate once heated leaving only a very faint aroma. Not as off-putting as you might think. But I recommend that you store this away properly in an airtight container once open. I'm sure I don't have to give you the reason for do so. Last but not least, make sure the dough is pulled and stretched to its desired length as it enter the hot oil for frying. This is the true secret to an ultra-light, thin and crispy you char kwai. Don't worry if this seems a bit tricky at first, you'll soon get the hang of it. It took me at least 5-6 ruined crullers before I finally got it right. And although the ruined crullers looked like the inferior shorter cousins, tasted absolutely fine. So not all is lost. In a small bowl, dissolve the sugar and salt in the hot water. Sift the flour into a large mixing bowl. Add the baking powder, bicarbonate of soda, ammonium bicarbonate and mix well to combine. Make a well in the centre and add the egg yolk. Gradually pour in the water and mix well to combine and form a wet dough. Adjust the water accordingly. Add the oil and knead the dough in the bowl for 10 minutes until smooth. Cover the bowl with cling film and refrigerate overnight. The following day, lightly dust the work surface and your hands with flour. Divide the dough into halves. Roll out one dough into a 24cm x 12cm rectangular, about 2 cm thickness. Cut into eight 3cm wide strips, and gently scored the centre of each strip with a sharp knife. Do not cut all the way through. Lightly brush the top of 4 strips with water and place the other 4 strips on top, scored side facing to form 4 stacks. With a thin skewer (or chopstick in my case), gently press on the centre of each stack lengthwise so they stick together. Repeat with the remaining dough and allow the stack to rest for 20 minutes before frying. Fill the wok with enough oil and heat to 180ºC. 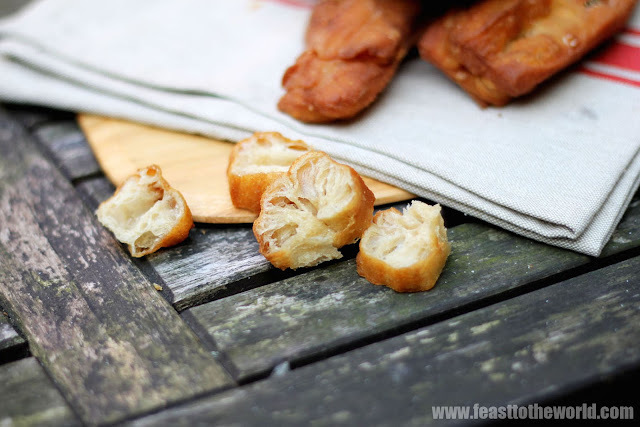 Test by dropping a small piece of stale bread, it should sizzle and browns in 30 seconds. When the oil is ready, fry two stack at a time and do not overcrowd the wok. Gently stretch each stack lenthwise by pulling both ends in opposite direction to about twice its original length before gently drop into the hit oil ( I do this over the wok as it is trickier to move the stack once it is stretched). Turn the dough sticks continuously and push them down every now and then with a tong or spider sieve to make sure they are submerged into the oil for as much as possible. Fry for 5-6 minutes until gold brown and crispy. Remove with spider sieve and transfer to some kitchen paper to drain. Repeat with the rest of the stacks. 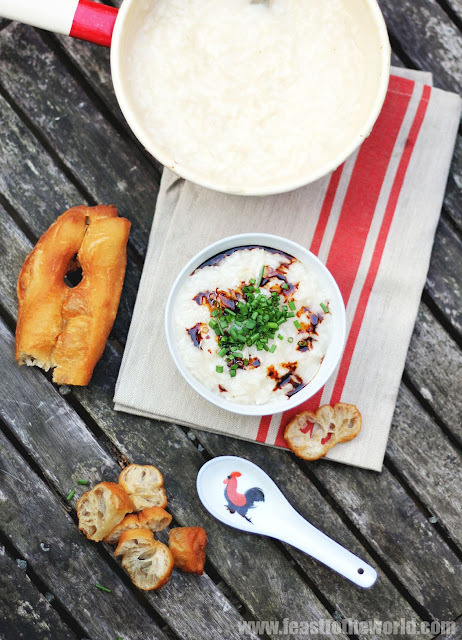 Serve the cruller warm on its own or with a bowl of congee. Fantastic effort. Now can you teach me how to make the cheung fun with this inside?